With a Mobile-First philosophy, Google continues to update its search engine algorithms to meet the demands of technologically-savvy searchers. In fact, Google has rolled out a Mobile-First version of its search engine index–this is the massive catalog of data on every web page in existence. In this scenario, mobile first means any page that can be correctly viewed on a mobile device. Since the mobile version is treated as the primary site for your business, it means businesses need to beef up content for this version. Here’s a complete guide to what this means. With the Mobile-First indexing, Google may organize their index based on entities–this includes how keywords and language interact with entities. Google wants to understand the relationships between different ideas and their descriptions. 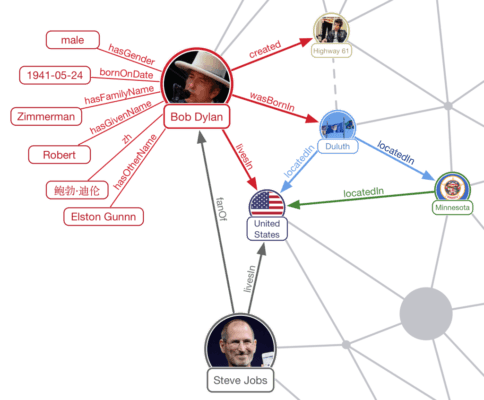 Think of the Knowledge Graph, and how Google organizes a hierarchy of relationships. It is not based on language, but, is rather a conceptual idea of understanding. And, entities can be depicted by feelings, concepts, keywords, pictures and more. If Google’s updated index was based on entities, then it no longer has to search through languages and keywords. Google can, instead, look at entities and then move to varying languages as needed. Even domains and brands can be entities. For example, all of Google’s global offices and international websites can be grouped together and considered one entity. Taking it a step further, a brand’s entity could include videos, apps, podcasts, maps, and more. But, with search engine optimization, it’s keywords that matter. Yet, a more efficient form of search is to search by entity. Yet, entity indexing has been a modifier with Google for a while. But, the Mobile-First indexing may mean that the index will be organized based on the Knowledge Graph–as opposed to the link graph. As they say, Google giveth and Google taketh away. Google may have created the link and keyword-building community, but they can also take it away. Entities are powerful because they offer a more efficient way to search, and they overcome language barriers. With the Mobile-First indexing process, Google may evaluate content for its mobile functionality with the domain considered an entity. Old desktop content will remain on the index, but, won’t receive any value. Links will still play a role, but they won’t be as important for indexing. Over the long run, Google may replace the link graph with a version of a Real User Metric. Instead of looking at how Mobile-First indexing will affect the crawling of your site, think about how the bot will render pages. If domains and URLs are simply facets of a domain entity, then crawlers can always look at deep links and regular web URLs. Google might even index CSS grid layouts. Perhaps it will be like removing the paper version of documents and replacing them with their digital counterparts. With the digital version, you wouldn’t need multiple copies in multiple languages–just one version can be translated instantly. The initial days of the Internet saw around 300 million people searching for basic queries and answers. Today, there are around 3 billion Internet users. Google CEO Sundar Pichai sees a logical transition from Mobile-First to AI-First. Google Assistant is already available, but that is only the beginning. Consider Amazon Echo, and self-driving cars. In fact, all the tech giants, and startups are investing in AI. This is a world with universal computing, available on connected systems at home, in the car, and at work. Think of how smart appliances will affect search and so on. You see, it won’t be just about devices–it will be about screens and the types of screens. Eventually, we’ll have holographic screens so, devices won’t really be needed either. How people access and interact with data will continue to evolve. And, your business should respond accordingly. Think of the impact Mobile-First indexing will have on the world. In the long run, it appears to be a push for multi-sensory data across a wide variety of devices that bridge the gap between on and offline resources. In terms of online shopping or mobile shopping, retailers might move from having to update their inventory every 24 hours to utilizing Just-In-Time (JIT) inventory processes. Through product sensors, Google can pull information from many sources including driverless cars and home appliances. Through connected devices and Big Data, every company will become a tech company by default. Think of AI, combined with voice search, cloud data, and more to create seamless shopping delivery for any product or service you can imagine. And, Google has been rumored to be working on a cross-device OS that supports both the Android OS and Chrome. When it comes to search, the objective is to have your entire site–fully available–for searchers to view. It can be a struggle to strip content that may clutter smaller screens. How do you decide what you can afford to strip down? Since Google announced its strategy to move forward with a Mobile-First index, the question remains how this action may affect the structure of the web. In addition, stripped down content affects link structure–which, is what helps raise your rankings on the search engine results pages (SERPS). Furthermore, it is still unknown how Google will crawl with its bots. Will the bots also be Mobile-First? On the other hand, what if the bots are mobile-only? In this context, it is critical to remember that Google isn’t eliminating the desktop index–they are just putting mobile first. And, it makes sense since most search traffic now comes from a mobile device. Google is in the business of ensuring high-quality and relevant results. As such, they have to meet the needs of the modern market. Google is stating that it’s better to have a fully functioning desktop than it is to have a broken mobile version. In terms of links, this means that external links can be picked up in both the desktop and mobile site. If you have good, in-content links, they will show up in both the mobile and desktop crawl. With Google’s index, the mobile version of your site will be the launch pad. For instance, when you view crawlbot traffic heading to your site, you should see an increase in the Smartphone Googlebot. Even if you still only have a desktop version of your site, you can still be included in the index–but, the price is fully-optimized mobile sites may experience a rankings increase. To put it another way, your mobile site may be considered the main version of your webpage. As a result, now is the time to fully optimize your mobile site. If you have implemented responsive design, then, Google’s Mobile-First change should not have a significant impact. Metadata–Make sure all titles and meta descriptions match your desktop. Structured data–Include the same structured data markup. Use mobile versions of URLs shown in structured data. Social metadata–Your mobile site should have the same social metadata. App indexation–Make sure you’re using a verified mobile version. Search Console verification–Add your mobile site. Content–Add all your valuable content to your mobile site, and ensure it is crawlable and indexable. Switchboard tags–Implement mobile switchboard tags. Server capacity–Your servers should have the ability to handle a larger crawl rate. Back in 2015 and 2016, released an updated called Mobilegeddon that was designed to make the web more mobile-friendly. But, for years, Google has been rewarding sites that offer full mobile compatibility. To Google, mobile-friendly means sites that can be viewed correctly on a mobile device. Google wants to make sure that people can view your page nicely, along with all your content, without having to zoom or scroll down repeatedly. You should take a gander at Google’s mobile friendly test to see if any of your mobile pages can use an update. Google wants your mobile site to convey the bare minimum of mobile-friendliness. Yet, with the Mobile-First index, it makes sense to go the extra mile. When you consider the fact that most of the world’s information was created in the past several years, it makes Google’s efforts seem astounding in terms of cataloging all that information. Google wants the information, and, also, how to access that information. Yet, when you update your site, it is often the case that old content remains. So, there is new content being added every second–to the index–and, this is on top of old content. At the same time, Google has warned us against removing old content so that archives remain for searchers. Given the vast amounts of data, Google has to keep up by making their processes more efficient and applying more stringent standards to their algorithms. They use sorting signals such as micro-formats and Schema to help keep crawling simple. What about the loss of the URL? The Mobile-First strategy isn’t just about how things are admitted into the index, but how they are organized. The Mobile-First strategy seems to infer a future that isn’t as dependent on URLs for organization. Google has consistently used metadata and URL structure to organize their index content. As a result, people too the one URL per piece of content strategy. Since the Internet is consumed by visiting URLs, this may change. There are vast amounts of data that is online, but, cannot be conveyed through a browser–this is the data tied to Big Data and the Internet of Things (IoT). Moreover, it is only accessible through APIs. But, Google wants the ability to use this information in their index and algorithms. To illustrate, with Google Now on Tap, content is lifted through feeds and APIs–they don’t always have a URL. When the URL is no longer necessary, then apps can compete directly with websites. So, Google can then focus on mobile experiences, rendering, and speed. Google has also been emphasizing the use of things such as AMP and PWAs. For example, AMP content lives on a URL generated and hosted by Google. The same is expected of Android Instant Apps. While Google did create the link-economy, it is now trying to distance themselves from it. Google has been moving towards XML feeds, Schema, and on-page structured markup. The top SEO companies have been preparing their clients for a couple years now. 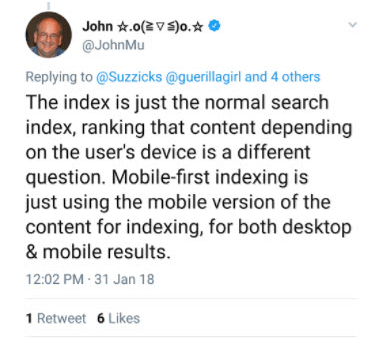 For those that still need to prepare for Mobile-First indexing, keep in mind that there will not be a new index or a separation between a mobile and desktop index. What Google is doing is changing how new content is added, with a Mobile-First perspective. In June 2017, Gary Illyes stated it could take a few years before Google gets to an only mobile index. But, Google is already rewarding optimized mobile sites right now. Here’s what you need to prepare for: Google rankings will be impacted if your mobile version is distinctly different from your desktop version or if it contains a lot less content. Since your mobile site will be treated as your primary site, it will affect how searchers view the value of your content and offerings. Consider this: Google has consistently updated algorithms to place a priority on sites with mobile-exclusive functionality. These can include Accelerated Mobile Pages (AMPs), and more. Although, there will be instances where the desktop version will be considered for rankings, such as if you don’t have a replicate mobile version of a specific page. Nonetheless, you should track search results for both mobile and desktop. There just isn’t a guarantee that Google will crawl your desktop site once they’ve seen your mobile site. What’s the takeaway? 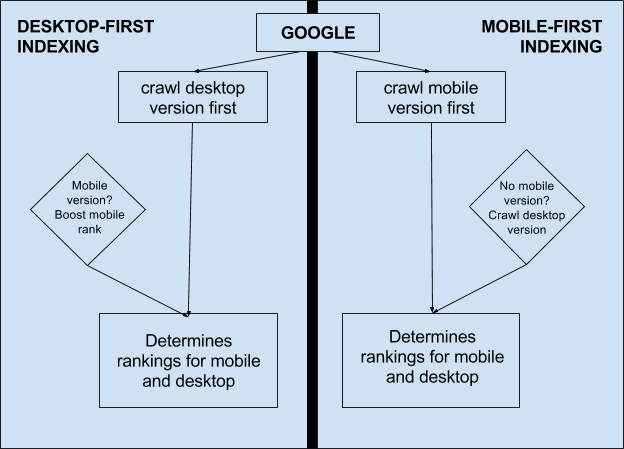 Don’t launch your mobile site until it is completely ready for crawling and indexing. A broken mobile site will hurt your rankings. Make sure your mobile version contains the same valuable and relevant content as your desktop site. Where does Voice-First stand in a Mobile-First world? There isn’t any question that modes of human-machine interaction are expanding into the spoken word. As people grow more accustomed to the trend, it will soon traverse from personal and home use to business and commercial use. If you love science fiction, you may notice it has often turned out to be a self-fulfilling prophecy. If you want to view the future, just watch any of the recent sci-fi movies and television series airing today. Voice-based computer systems have been introduced into popular culture through TV shows in the 60s such as Star Trek and The Twilight Zone. This is just the start. Voice is simply a natural extension of our physical-based outputs from typing and tapping. Consumers are wanting this option to expand in more complex ways. Once you use voice, you just want to keep using it. As a result, it’s quite easy to see the potential. This is transforming the end user experience by executing more than one task, quickly. For example, voice-first is hands-free so, users can give commands to multiple systems within a matter of seconds–there is no need for a physical interaction. The Voice-First movement used to be screen-first, but that has changed with Google Home, which has no visual display. Google Home relies completely on audio. Taking the form of smart speakers, these devices may also utilize cameras for visual input. Now, think of Google Actions, which is a digital option for ranking. Google Actions are part of the Google Assistant software that lets you interact seamlessly with Google Home. Through cloud-hosted utilities, users are taken through a series of questions to determine what they need and want. It’s a trend worth your attention because it seems that Google is doubling-down on these types of technologies. Google has certainly made a strong push to incorporate Google Home and Google Assistant into many of its suites. There are over 400 million devices that have Google Assistant. Google Assistant and Google Home can also work with or without a screen. So, they are ideal for the IoT. Companies can also take Google Actions and incorporate it into their systems. Google Assistant does conflate searches for actions or commands. And, AI can be programmed to understand the varying preferences, based on voice. This means the system can comprehend various intents. With this in mind, Google’s Mobile-First index may use different algorithms for search implementing those with AI feedback and voice-first choices. Then, the entire search experience could change significantly. Each device will have a different AI response and search intent. The index will have to change in response. You’ve probably already noticed how Google is moving away from no-click search results with answer boxes, visual representations, and even sounds. What’s the point of click-free search results? They can be read out loud with or without a screen. And, they are truly Mobile-First. It also means that many queries can be given an increasing number of click-free results–something altogether different from the reliance on URLs over the years. Traditional web results may still be in place, and Mobile-First may still utilize the same ranking factors, but mobile-first options will rank higher. Google seems to be pushing for a screen-free, eyes-free type of interaction. In terms of Google Actions, it can be activated by simply using a registered keyword. This then launches a verbal dialogue. And, it seems to be a point of entry for the future with the IoT. A question will find answers, and a command executes an action. For instance, you can find out if a store carries organic, locally-grown strawberries, then voice a command to have them delivered to your preferred address. With the right technology, you can ask a question then direct a related action. Since Google has been focusing their research and development on AI and the IoT, it makes sense that this would be where the push is directed. In January 2018, Google’s CEO said that AI is more innovative than electricity. Google had already integrated AI into Google Now-on-Tap. Then, through entity understanding, these technologies can determine a user has a query or wants to take an action. Perhaps, Mobile-First indexing will place different ranking factors on the type of query and device. Google Assistant doesn’t need a screen to work. Think of results that are compatible with the technologies used. A screen-free voice query would not need a URL. When using voice, people expect a quick response. 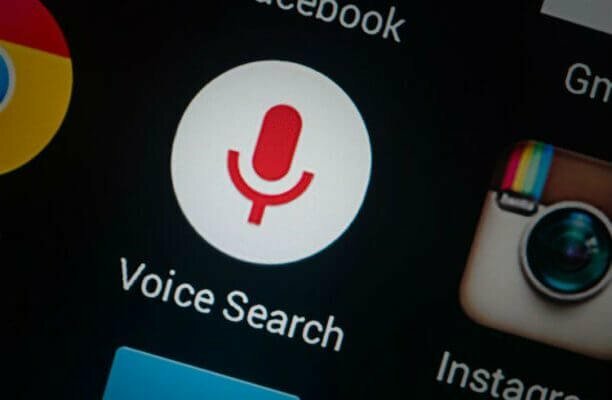 Of course, voice search isn’t at the stages where it would be useful for writing an epic novel, and performing all the necessary research, but it will get there. Nonetheless, voice searchers don’t want to hear about a long list of URLs. So, Google has started to offer more results in the form of questions and answers. This helps to increase the potential to have a conversation. Take a look at Google Maps, and you’ll see the “business finder” already offers interactive questions and answers. There are many “yes” or “no” and “multiple choice” answers. And, multiple-choice is a good fit for AI. Yet, Google will also include more Featured Snippets that show several snippets at once. You can then select the most appropriate snippet based on your query. The more you play with snippets, the better the AI can organize your options based on your previous clicks–incorporating machine learning. The more you interact with Google, the better your results will be. Just as mobile phones can index your data such as purchases, travel, meetings, and more. With AI, personalization will increase dramatically. More personalization makes it difficult to predict how rankings may change from one day to the next. On the other hand, if you have strict privacy settings, then accurate results may not come as quickly. Nonetheless, this makes it difficult to grasp in terms of SEO. Voice-first can truly change the dynamics with intuit meaning and personalization. To illustrate, stressed words can show intent. Google would provide cards of different feeds, and the user chooses the card/feed of their preference. The AI system then catalogs those choices for future reference. It feels similar to the knowledge graph method of organization with hierarchies. With the knowledge graph, you can extend your voice query to a conversation based on relationships to your feed choices. Say you want to learn more about cats, then you are sent a series of verbal prompts and perhaps receive this question, “Would you like to learn more about orange American tabbies, or something else?” The prompts and voice-only search will take you down a relational path to get the information you need. Think of designing your content to meet the needs of voice-first devices. The removal of screens makes these devices appear almost magical. In a decade, it’s safe to assume that over half of all computer-based interactions will be voice-first. How will you transition your SEO, business, advertising, and product models? Since Google designs their index, it is important to make your mobile updates based on Google’s guidelines. The rollout will continue in batches, some larger than others. During this time, many assumptions will be made regarding what types of features your mobile site needs to have and what to eliminate. It’s your site and your decisions but always refer to Google before making any changes. Google made the move because, in 2015, more searches were made on mobile–including the U.S. and Japan. When searchers type in a query, Google needs to provide results fast. To illustrate, many ask about rel=canonical/switchboard tags. According to Google, you should leave them as is. The Internet has billions of pages, searching through every single one would be too slow. As a result, Google uses web crawlers to view the database or index. Google creates the index by saving pages. Previously, the index was tailored for the desktop. Now, it will cater to mobile. To get through this indexing change as successfully as possible, the recommendation is to use responsive web design. It is a design that implements one model for both your desktop and mobile site that will fit almost any device screen. It also removes the obstacle of requiring searchers to type m. before your site’s URL. The name “responsive” means the site automatically responds to a different screen size and configures its content to function seamlessly. It changes the layout to meet mobile usage. Since you are now aware of Google’s Mobile-First indexing change, the time to use responsive design is now. Take a look at the statistics for your mobile viewers, vs. your desktop viewers, and you won’t have a more convincing reason to switch to responsive design. Then, take a look at your competitors’ sites on multiple devices. Are they easy to navigate? Updating your site with responsive design isn’t outrageously difficult. You either hire a web designer with responsive design experience–which, most have. Or, you can use a web hosting service that lets you create a responsively designed site on your own. There are also responsive templates you can purchase through sites such as WordPress. There isn’t any excuse not to go responsive. While Google isn’t going to immediately purge your heavily-indexed desktop site, having a matching mobile site will ensure your pages continue to rank well. Add to that dynamic serving where the server responds with varying HTML and CSS depending on the request, and this is all on the same URL. With dynamic serving, you get the best of both worlds. All you need is one URL for all devices. Plus, consider the time savings you would accumulate when you no longer have to manage two completely different sites. 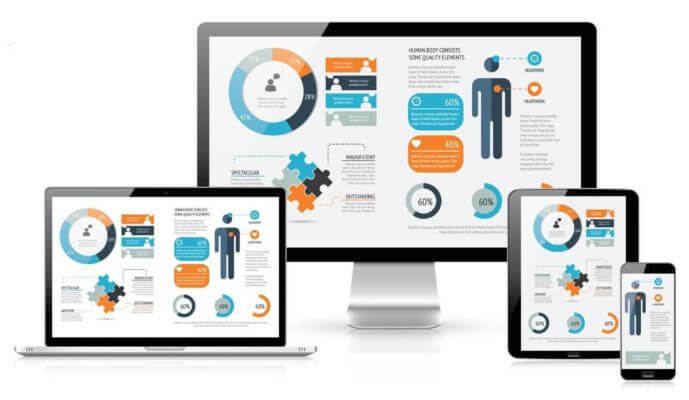 If your site is responsive, you’re ready. And, Google may force all web pages to go responsive anyway. Google CEO Sundar Pichai wrote this in his 2016 Founders Letter, “We will move from mobile first to an AI first world.” Since then, he has restated this sentiment several times. So, think of AI in terms of SEO. AI requires the processing of relationships and content. Chatbots are powered by AI. And, they don’t require a website to get the answers they need. In fact, elements of AI can be plugged into any website or mobile app. In addition, AI can be incorporated into the Internet of Things (IoT). As Googles continues to develop the best AI systems in the world, the need to have access to big data in real time. What does this mean for URLs? It means that URLs are holding that process back. Since websites have become much more sophisticated over the first days of the Internet, Google has had to focus more on user experience and the content offerings. Since the web continues to grow at an astronomical pace, reliance on URLs becomes more inefficient. On the other hand, Google has been able to use cloud-computing to host pages of databases–this is much more cost-efficient than crawling URLs. Google can just tap into APIs, XML feeds, ServiceWorkers, and JSON-LD feeds. Add to these facts, the prevalence of Google Home and Amazon Echo usage–these devices don’t have browsers and sometimes, they don’t have screens. Google has to embrace all types of devices in the way it presents results. If you want to dive headfirst into Google’s Mobile-First indexing strategy, then you might as well create a mobile app for your site. While this means managing two sites, there may also be a time when Google focuses on app streaming and goes “mobile-only.” Might as well get a head start. 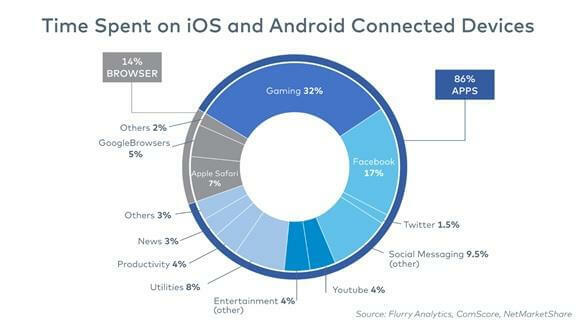 You might have already noticed the number of mobile users is much larger than desktop users. Given that metric, your app stores are also filled to the brim with apps. Furthermore, research has shown that many users prefer mobile apps to mobile websites. When going the mobile app route, think of it in terms of the user experience. Since Google has been moving towards placing a prominence on user experience, then a mobile app offers a more personalized route. Apps can be designed to provide geography-specific content in addition to monitoring user engagement and offering settings customizable based on user preferences. So, every user can create an experience unique to their needs. This is different from a responsive site that is optimized for mobile, but, may not offer as many personalized options. Then, there is the notifications tool where you no longer have to use email to reach your customers–you still should, but you now have another avenue of communication through mobile app notifications. You have either push or in-app notifications. This is one of the many reasons why so many businesses are making the move towards creating a mobile app. In-app notifications are only viewed when a user opens the app–so, you already have their attention. Not to mention, apps can work even in offline mode–they still provide users with basic functionality, which is different from websites that need an Internet connection. And, there aren’t any restrictions such as a “back” or “refresh” button. Apps don’t really need to be refreshed. Users simply “tap,” or “swipe,” to get what they want. The mobile app also offers a different branding experience. Your company can experiment with new styles and features or let your users customize the appearance based on their liking–this goes back to a positive user experience. And, keeping in line with Google’s Mobile-First indexing strategy, mobile users spend 86% of their time on mobile apps. The mobile app gives enhanced brand presence for your business. Even when users aren’t actively engaged with your app, the icon serves as a small advertisement on their device screen. Plus, mobile apps can be designed to work a lot faster than a mobile website. Since data is often stored on the mobile devices, retrieval is much faster. Users enjoy faster load and access times. And, Google will notice. Eliminate pinch and zoom. This seems pretty straightforward. The days of customers accepting “pinch and zoom” activities are over. 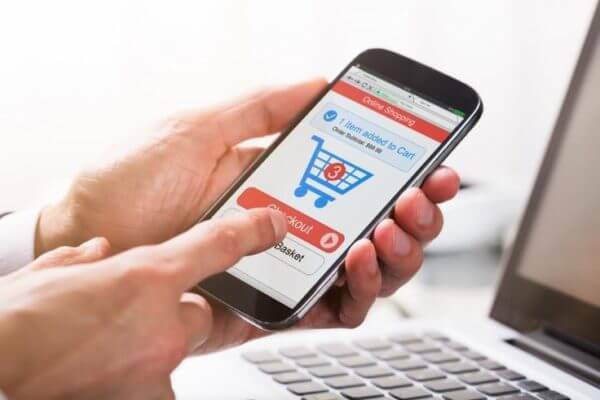 You can expect more bounces and cart abandonment if your customers have to pinch and zoom their way through the checkout process. Make the checkout process easy. Even in the age of the Internet, customers still want to feel safe when purchasing something online or through a mobile app. One way to make them feel more secure about the process is to simply give them what they need. Use only short forms, and, make it easy to check out–in just a couple of taps. The last thing you want is for customers to quit when they’ve almost completed the process. Incorporate security seals. Prove that you have implemented adequate security controls to keep financial data safe. With cyber-theft at an all-time-high, mobile customers will patronize sites that show security icons at checkout. These security icons help to build trust, and trust leads to conversions. You can also incorporate credit card logos from global brands such as Visa, Amex, and Mastercard–as long as it doesn’t clutter your mobile space. Allow your users to check out as guests. You’ll get more conversions if you let people check out anonymously. There are many shoppers who don’t want to submit an email address and password, but, would still like to purchase your products or services. These people have been burned by other companies who have either spammed their inbox or sold their information to third parties. So, give them the option to checkout without having to register. This speeds up the process, especially on a mobile device. They can always register later, at their convenience. If they like your products, they will usually end up registering anyway. Make your buttons readable. Ensure that your checkout buttons are readable and easy to tap. Also, space them well so that customers won’t accidentally tap on the wrong button. Eliminate pop-ups during checkout. Everyone hates popups. Don’t let them stand in the way of making another sale. Take a look at how Google incorporates Google Wallet as a cross-device payment system. It is secure on any device too. It can hold multiple payment options from credit cards to PayPal. It can also be used for instant payments to services such as Netflix, and a variety of mobile apps. Also, Google Home and Google Assistant offer cross-device shopping experiences both within and outside the Google world. All it takes is a voice command to make a purchase. This offers a secure and seamless shopping experience–as your checkout experience should be. It’s important to adapt to the evolving landscape of this space. You don’t have to reinvent the wheel; just rely on Google’s existing systems. An accordion menu expands to show hidden information. As a result, mobile sites can include much more content without taking up more space. In the past, many worried that Google will penalize their site for hidden content–with the Mobile-First indexing strategy that will no longer be the case for mobile sites. The reason is Google wants the mobile site to include as much valuable content as possible–that can be difficult when device screens are smaller. So, the accordion design element can help to implement more content without displaying too much content all at once. The user gets to decide what they want to view. They also help to prevent mobile sites with too much information, that require users to keep scrolling. Users don’t want to interact with mobile sites that display too many disparate and unrelated pieces of content. Moreover, they don’t want to scroll to the bottom of the page just to get the answer to a question. Instead, the accordion design element tells users exactly what the site is about and gives them easy access. Plus, they also function as section headings. By condensing information, in limited spaces, mobile sites can enhance the user experience and please Google at the same time. By using jump links, and persistent accordion headings, mobile sites can effectively keep users engaged with the site. While accordion menus don’t work for every mobile site, they can work if you need to condense a lot of content. Google simply prefers HTLM5. In fact, Google has been phasing out support for Flash for a while. In the past, Flash has worked for displaying rich media. But, HTLM5 offers lower power use with quicker load times. So, don’t even think about using Flash on your sites. Java has massive open source support, with many libraries that make it easy to access what you need in terms of development. Plus, it offers protections for potential issues that come with native code such as bad pointer usage and memory leaks. Furthermore, Java gives you the ability to create sandbox applications with heightened security. While many platforms decline after a while, it seems that Java continues to be a premier software and mobile app platform. It is already used substantially in big data, mobile, enterprise applications, and more. In addition, the number one platform in the world is Google’s Android platform. And, many developers use Java to build Android apps. As apps move to smart and connected devices such as TVs, and refrigerators, you’ll notice they use Java too. Java’s current iteration also features JSON APIs, modularity, and more. You also get support for the latest Web standards and the cloud. It appears to be a good language to use for a mobile-first outlook. Should I follow the Web AMPs trend? Launched in February 2016, web AMPs (accelerated mobile pages) are the latest and greatest in terms of web development. You get a remarkable UI with seamless in-app browsing. AMP results also tend to rank at the top of the page. Google created AMPs to improve load times, rendering and more. In fact, these AMPs can be rendered either in the browser or in WebViews. This open-source design was built to improve mobile sites. As a result, if you are seeing large amounts of traffic–switching to AMP will improve performance, as well as easing the load on your servers. Furthermore, it enhances the user experience since it provides faster loading times. So, you can achieve lower bounce rates and better engagement. These are also independent documents as opposed to stores of metadata. There isn’t anything you can compare an AMP to anything since AMP does not have a dedicated client, besides the browser. It is basically a set of specifications and technologies infused into this product. It is also a lighter version of HTML cached on Google’s cache. According to the AMP Project website, over 1,000 AMP articles are published each day and return mobile users have gone up from 51% to 63%. If an increasing number of your visitors are coming from mobile sites, then you should switch to AMP. With regard to SEO buzz, AMPs have gone further than Facebook’s Instant Articles. When you consider that 53% of web pages are abandoned when they take over three seconds to load, it makes sense. In fact, conversions can go down by up to 7% with just a one-second delay in load time. AMPs load your pages 4X faster. Also, because it is open source, it is consistently updated. Moreover, it can reduce document size. What’s most important? Google encourages publishers to use AMP. Because of its speed, you will notice an improvement in your SERPs ranking. You’ll also achieve a better Google Page Speed Insights score. Since Google is on the path of Mobile-First indexing, then now is the time to get your mobile site in order. To be clear, AMPs are fast-loading web pages built for mobile. 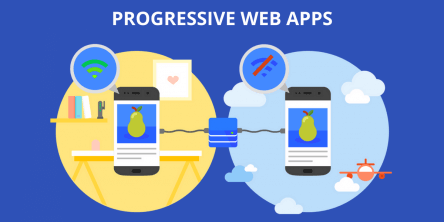 Progressive web apps (PWAs), are mobile web pages that offer an app-like experience. So, you can access content while offline and even send push notifications. PWAs also offer fast loading times, and, are reliable regardless of Internet connection. You can access both AMPs and PWAs via URLs. Some say PWAs may replace the standard mobile app. It’s highly possible since a PWA offers the benefits of a mobile page an app all at once. You can also manage all of it together. The ServiceWorker has two parts, an app shell that controls the behaviors of the display and the part that controls what elements are cached in the mobile device’s local storage. Thanks to the ServiceWorker, it can work offline and execute push notifications. Also, PWAs offer the power of an app without the need for installation. Not to mention, Google has already stated they will automatically index PWAs in their App store. Google has struggled with indexing and crawling native app content. For starters, it’s already difficult with Android apps and even more difficult with iOS apps. As a result, Google uses APIs to translate the content. In addition, Google has to align web content with app content. Here’s the kicker: The majority of native apps can be switched over to become PWAs. When a website has an app manifest, (which hosts the app icon), and a ServiceWorker, it is just like a PWA. The next steps are just to make modifications in design and to incorporate app behaviors. The only difference is, while designing your PWA, it is crucial to think like a mobile developer. With PWAs, you get a seamless experience on any device that doesn’t require app-specific programming. Plus, PWAs can store app-states in the cloud so that users can pick up where they left off on any device. Google Assistant has also improved its ability to interact with PWAs. Moreover, PWAs require less storage space, so that mobile devices won’t be drained. So, regardless of OS, PWAs can work on more devices than other design types. They can be displayed on the desktop and mobile, including the iPhone. Then, there is the fact that Google has been switching many of their basic Android apps such as YouTube, Contacts, and News into PWAs. This seems to be a signal. What you can do is use both the PWA and an AMP. You start the user with an AMP page. On the next click, they can then be taken to your PWA. How is that possible? Google introduced <amp-install-serviceworker>. Blending the two together is what Google calls PWAMPs. SEO is important to your business, but don’t freak out. The information and tactics above will help with your preparation for Google’s continued Mobile-First rollout. For now, place a priority on your mobile experience. Nonetheless, Google consistently makes frequent changes. We’ll keep you up to date with the latest resources to ensure you’re always one step ahead. News Update: Is Google factoring AMP pages into SERP?